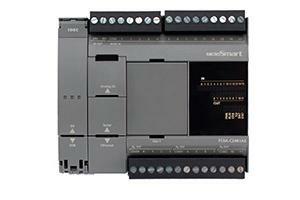 MicroSmart FC6A , a powerful PLC with up to 520 digital I/O and 126 analog I/O. The MicroSmart FC6A provides the power of a PAC (programmable automation controller) in a low-cost controller with a small form factor, making it an ideal fit for demanding applications. Three MicroSmart PLC models are available, each with 24 Vdc or 100-240 Vac input power. The 16 I/O model has 9 inputs, and 7 relay or transistor outputs. The 24 I/O model has 14 inputs, and 10 relay or transistor outputs. The 40 I/O model has 24 inputs, and 16 relay or transistor outputs. Each model also includes an integral 0-10 Vdc analog input. The 16 and 24 I/O models can accommodate one plug-in analog cartridge, and the 40 I/O model can accommodate two plug-in analog cartridges. Each cartridge has two analog I/O points, either two inputs or two outputs. Basic instructions can be executed in 0.042 microseconds, and program memory is 640 kB. There are 1,024 timers, and six of the 512 counters are high-speed at rates up to 100kHz. These capabilities are combined with extensive data and bit memory, double the capacity of a typical micro PLC. These features allow the MicroSmart PLC to handle large programs with complex control requirements such as PID, flow totalization and recipes. All models have a built-in RJ45 Ethernet port, and an RJ45 RS232C/RS485 serial port. A plug-in cartridge adds an additional RS232C/RS485 port. An SD memory port and a mini-B USB port can each be used for data logging, program storage/transfer, firmware updating or recipe storage. The Ethernet port supports the Modbus TCP protocol, and the serial port supports the Modbus RTU protocol. IoT capability is provided by custom web pages which can be configured for remote monitoring and control. These web pages are stored in the MicroSmart PLC, which functions as a web server when its built-in Ethernet port or the HMI Ethernet port is connected to the Internet. These web pages can be accessed via any web browser running on any Internet-connected device such as a remote PC, a tablet or a smartphone. Up to 4 expansion modules can be added to the 16 I/O model, and up to 15 expansion modules can be added to the 24 and 40 I/O models. These modules can be of any type with no restrictions as to the number of analog and specialty modules. This gives the 40 I/O MicroSmart PLC the capability to handle up to 520 I/O with a maximum of 126 analog I/O, much more than a typical micro PLC.The 40 I/O model also includes support for the CAN J1939 protocols. The CAN J1939 protocol is often used in diesel engine applications for various types of vehicles and vessels, and for mobile power generators.